Category Archives: Dr. Seuss’s How the Grinch Stole Christmas! Hollywood, Calif. – It’s the most wonderful time of the year at The Entertainment Capital of L.A.SM as Universal Studios Hollywood™ and Universal CityWalk® deck the halls for a wintry calendar of cool holiday activities and scrumptious treats that families and friends far and wide can enjoy. 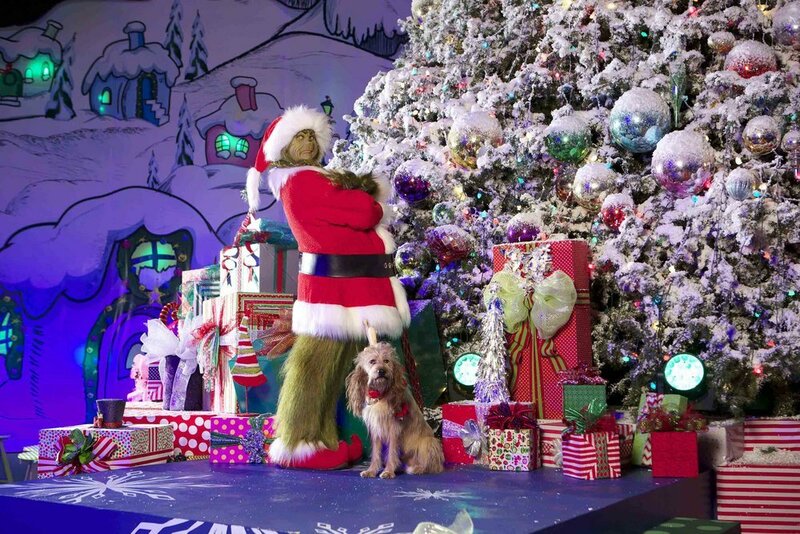 The spirit of “Grinchmas” also will come to life aboard the world-famous behind-the-scenes Studio Tour with engaging performances by unforgettable Who-ville Whos re-enacting popular scenes and songs from the family favorite at the original film sets from the blockbuster film, Dr. Seuss’ How the Grinch Stole Christmas. The holidays at Universal Studios Hollywood are included in the price of theme park admission. More information is available at www.UniversalStudiosHollywood.com. The spirit of the season continues with a wintertime transformation of Universal CityWalk, beginning the day after Thanksgiving on Friday, November 25 through Sunday, January 1, 2017. A spectacular 40-foot tall Christmas tree will glisten with 200,000 LED icicles choreographed to the lights and sounds of the season in the “5 Towers” plaza. Santa Claus will make nightly appearances and offer special photo opportunities at “5 Towers.” The iconic, dancing water fountain situated at the heart of CityWalk also will make a splash this holiday season. This modern and impressive fountain displaying over 230 individual power jets will project streams of choreographed water into the air complemented by red and green LED lights and an array of holiday-themed music. Free concert performances at “5 Towers” and an eclectic ensemble of talented street performers will make CityWalk the ultimate L.A. holiday destination. Admission to Universal CityWalk is free. To learn more about Universal Studios Hollywood and the various Annual Pass options, including the new California Neighbor Pass, please visit www.UniversalStudiosHollywood.com/tickets. Additional information is available at www.UniversalStudiosHollywood.com. Like Universal Studios Hollywood on Facebook and follow @UniStudios on Instagram and Twitter. About Dr. Seuss: Theodor “Seuss” Geisel is quite simply the most beloved children’s book author of all time. Winner of the Pulitzer Prize in 1984, an Academy Award, three Emmy Awards, three Grammy Awards, and three Caldecott Honors, Geisel wrote and illustrated 45 books for children. Hundreds of millions of copies have found their way into homes and hearts around the world. While Theodor Geisel died on September 24, 1991, Dr. Seuss lives on, inspiring generations of children of all ages to explore the joys of reading. About Illumination Entertainment: Illumination Entertainment, founded by Chris Meledandri in 2007, is one of the entertainment industry’s leading producers of event animated films. Illumination, which has an exclusive financing and distribution partnership with Universal Pictures, is the creator of the hugely successful Despicable Me franchise, which includes Minions, the second-highest-grossing animated film of all time, as well as Despicable Me 2, an Academy Award® nominee for Best Animated Feature of 2013. In all, Illumination’s films, which also include the 2016 record breaking The Secret Life of Pets, 2011’s Hop and 2012’s Dr. Seuss’ The Lorax, have grossed more than $4 billion in worldwide box-office revenues and feature some of the world’s most renowned talent. Upcoming films include Sing, starring Matthew McConaughey, Reese Witherspoon, Seth MacFarlane, Scarlett Johansson, John C. Reilly, Taron Egerton and Tori Kelly, which arrives in theaters in December 2016; Despicable Me 3, starring Steve Carell, Kristen Wiig and Trey Parker, which is set for June 2017; and a newly-imagined version of Dr. Seuss’ How The Grinch Stole Christmas, starring Benedict Cumberbatch in the title role of The Grinch, which is set for November 2018. In addition, “Despicable Me: Minion Rush” (more than 750 million downloads) has become one of the world’s most popular apps, and Despicable Me: Minion Mayhem attracts huge crowds at Universal Orlando Resort and Universal Studios Hollywood. About Universal Studios Hollywood: Universal Studios HollywoodTM is The Entertainment Capital of L.A. and includes a full-day, movie-based theme park and Studio Tour. As a leading global entertainment destination, Universal Studios Hollywood delivers highly themed immersive lands that translate to real-life interpretations of iconic movie and television shows. Recent additions include “The Wizarding World of Harry Potter TM” which features a bustling Hogsmeade village and such critically-acclaimed rides as “Harry Potter and the Forbidden Journey” and “Flight of the Hippogriff™,” Universal Studios Hollywood’s first outdoor rollercoaster, as well the all-new “The Walking Dead” permanent daytime attraction. Other immersive lands include “Despicable Me Minion Mayhem” and “Super Silly Fun Land” as well as “Springfield,” hometown of America’s favorite TV family, located adjacent to the award-winning “The Simpsons RideTM.” The world-renowned Studio Tour is Universal Studios Hollywood’s flagship attraction, inviting guests behind-the-scenes of the world’s biggest and busiest movie and television studio where they can also experience such authentic and immersive thrill rides as “Fast & Furious—Supercharged.” The destination also features the Universal CityWalk entertainment, shopping and dining complex, including the Universal CityWalk Cinemas and the “5 Towers” state-of-the-art outdoor concert venue.